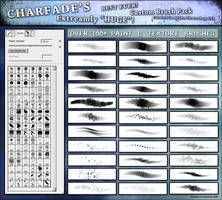 Also, as long as I don't share with anyone, and/or give you a copy to sell at your discretion (it's obviously all up to you, as they're your brushes ), may I convert these to work with other programs such as GIMP (which these days is almost identical to Photoshop) or possibly Krita (which does some amazing brush-related stuff that Photoshop could only ever dream of, and is FREE), MediBang Paint (my fave sketching program at the moment, almost as awesome as Krita with the sheer amount of brush options & settings, and again, free - although you have to sign in to use it...), etc.? Of course, again, if you allow any, the limitations would be up to you. I would NOT change the brushes themselves (the bitmaps, and whatever else you'd like, *NOT* mucked with, should you allow them to be used at all), just basically convert them for use in other program(s) if you allow it. And if you want, of course, if there's any sort of change beyond converting formats (like having to redo or remake a setting so it works in said program(s)), I would ask if you want before changing anything. Basically, I'd just be converting them and if there are ANY changes that need to be made, I'd keep things as close as humanly possible to the original. Sorry for making such a long comment, I just wanted to let you know that I take your work & copyrights seriously. If you say no, well, that's that and I won't bother you anymore. Thanks for reading, though! I hope I didn't take up too much of your time. You are free to change anything you like, though I would definitely like a copy of ones that work in other programs because I use some of those too and would like to be able to use them as well as add them to the download for anyone who buys. ^^ Thank you for your consideration, it means a lot. Just let me know if you make anything with them, alright? 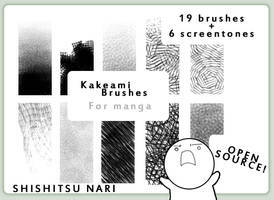 I have a cloud mist paint brush too but I don't know how easy that one is to translate over since it's a smudge brush. Oh, you are so awesome and generous! Thank you! I'll definitely let you know when I get around to converting them, and/or using them. 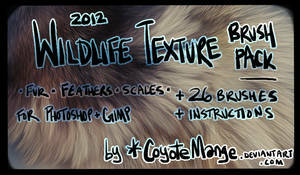 And of course, I'll send you a link, I'll probably upload the converted brushes to stash. There are plenty of programs nowadays that use the smudge option. It may work a little differently, or have a different name, but it's in pretty much everything I've mentioned and then some. 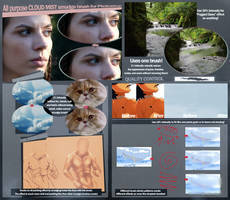 GIMP, like I said, is comparable to Photoshop itself now, especially if you add certain open source/free plug-ins. It's a little uglier/clunkier looking, but again, it has pretty much the same capabilities. It even has paths and a curves function like Photoshop does. 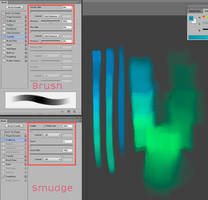 Converting Photoshop brushes to GIMP brushes is easier than converting to other programs, if I remember correctly. Aww, thank you! I can't do commercial at the moment (have some chronic illnesses that make it extremely difficult to finish anything in a reasonable amount of time), but once I've gotten my health back on track, I'm hoping to actually make money off my art, lol. So again, thank you. 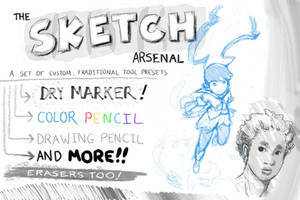 would this work with "Krita"? Well, these are cool ^_^ How fortunate that I actually had some points! One thing I noticed is that the watery brush seems to have a bit of a drag to it. None of the other brushes seem to have this issue and work beautifully, and I love the swatch! 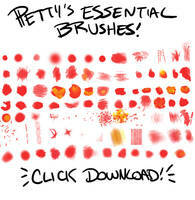 trying to get into "brighter" colors and this will help me immensely. Thank you so much, I hope these help. ^^ I hope I can figure out how to fix the drag issue, it may be too many settings or the rendering settings in photoshop. But operating systems and different computers can be so unique, it's hard to tell. ^^ Show me what you do with them if you get the chance! No problem ^_^ I have to do a lot of practicing with them, though. 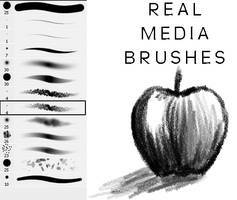 Are there somewhere more examples of these brushes being used? 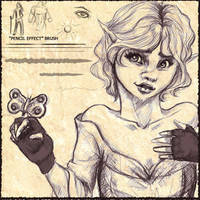 Yes, they're used in most of my artwork. 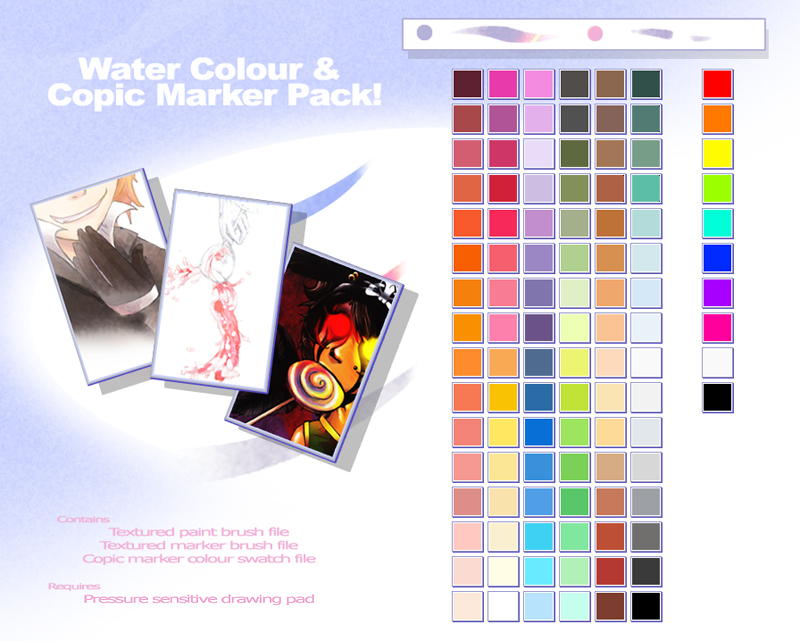 Not my vector art(because those are made with the paint bucket and gradients), but paintings and sketches. These are wonderful, thanks for uploading them. Thank you!! I'm glad you like them. Damn it!...Looks like I'm gonna have to buy this. Oh well looks great. Very useful, high functionality and easy to install. Thanks for making this. hi!! 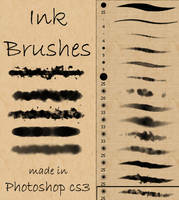 I'd like to ask you something... First of all: is there a sample drawing made with these brushes, so that I can see how the final effect is?? Also, do they work even on mac?? Thank you~ sorry for bothering you. 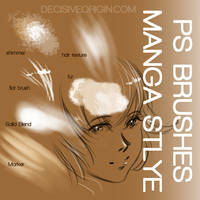 The drawings in the preview are made with this brush. It's no problem at all. =3 And they should work if you have photoshop, as long as you know how to install brushes in photoshop on a mac. 365icon.com/how-to/how-to-inst… This might work. Hi I was wondering would it be possible to purchase these via paypal? 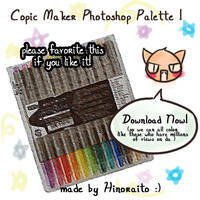 Can you make this for paint tool sai >-< ? I don't have paint tool sai or know how to convert things from photoshop to paint tool sai formats. Thank you for these. I've had 'em for about a year now and I use them on literally everything now as my shading/detailing brushes.
! They're one of my personal favourites! 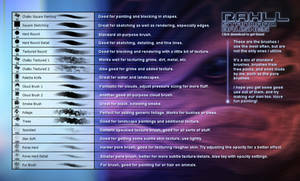 If you'd like another photoshop add-on, I have the cloud-mist blender set. 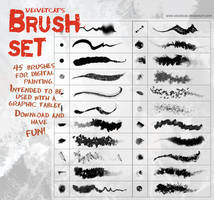 Between that brush and these, I haven't needed to download a brush set in ages! Any examples in your own art of these? The pictures in the previews were drawn with these. That's because they were made four years ago and their anatomy is not very good. Ah. Wanted to focus on the color anyway. Ohwelll. Looks very useful. Thank you.